I was up at at ’em at 4:30. Mom grumbled, but I pretty much wake up at that time most mornings during the week, wasn’t anything different for me. Mom digs pre-run bananas. I HATE ripe bananas. If they are ripe they get frozen, in bread, in oats, etc. That being said, the oats with the almond butter was my pre-run meal of choice. Checked the Accuweather before we left. It said it was 64, with the temperatures to hold steady near 70 all morning with 99% humidity, then at noon it would then be up toward 80. What freaking month is it? Pulled onto the highway and it started raining. I wasn’t concerned, especially since I had bird crap all over my car and wanted it to get clean. I kept telling mom the rain was fine. Parked, got pottied, and then I lost her. I prayed she went to where the shuttle bus was and wasn’t looking for me. In the crowd of 6000 (it’s a limited entry race, sold out). I ran into ARC President and buddy Megan. 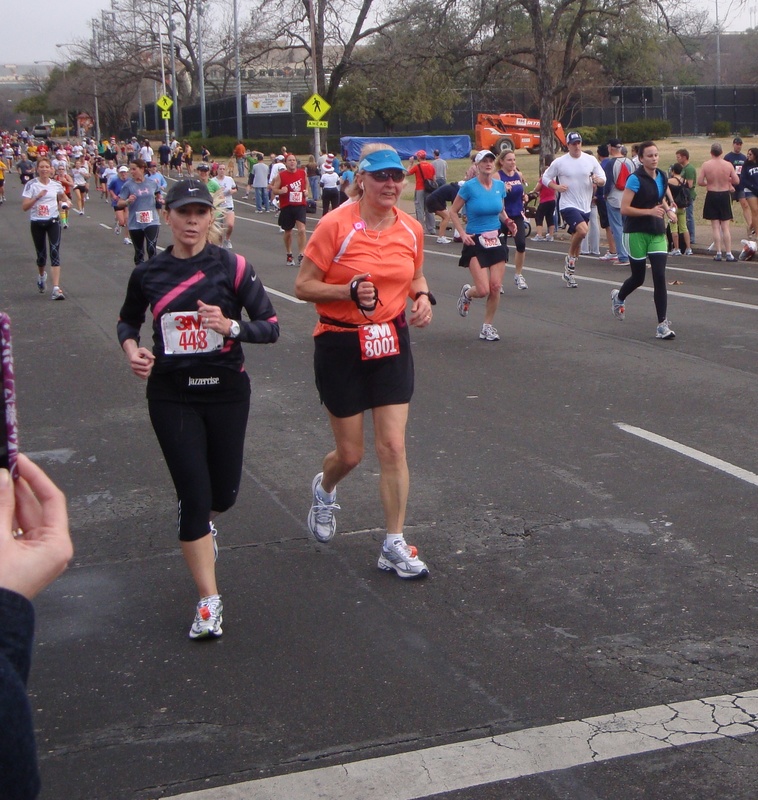 She was running today as a prep for the Austin Marathon which is in 3 weeks. This race isn’t seeded or organized by pace, it’s self corraling, which I HATE. I always get stuck behind strollers and walkers, no matter how far up I manage to get. The first two miles are pretty packed and I didn’t want to be a sardine. This year I started way closer to the front than usual (I ended up starting 50 secs behind the elites). I never saw the elites, probably because they were half way done before I finished the first mile, lol. We started on time exactly, which hasn’t happened at that race in a while. (last year we were 1.5 hours late due to severe winds blowing over all of the barricades). It was dark for at least 4 miles, which was awesome, because it was a wet and gross mess and I didn’t want it to get any steamier. I felt tired the whole race, I am guessing it was the weather, although i’ve run the same distance in direct sun in April and 20 degrees warmer, so I know i’ve been through way worse. Saw mom at 6.4 and she got started for our 2nd leg of the relay. I then threw my relay Dtag down. (I originally had it on my other shoe, but learned on the web last night that if both relay persons crossed the finish, you get DQ). So I tied it to my skirt, untied it at 6 and tossed it after I crossed the 10K mat before the exchange. Dad, sister, and sisters BF were at 10.5 which was perfect, because they saw me and mom (at different times, I didn’t run the 2nd half with mom). And it was right before what looked like a hill and mom hates anything that isn’t flat. I drove the course with her in early January to show her they were baby hills. I told them as I passed to cheer her up that hill. I picked it up a little in the last 2 miles but I was really struggling with fatigue. My kick at the end wasn’t much kick, but I did set PRs today for half relay (i’ve only run one, lol! hey, it’s automatic), course PR, and an overall PR. I missed my goal time by 11 seconds. Whatever, i’ll take it. 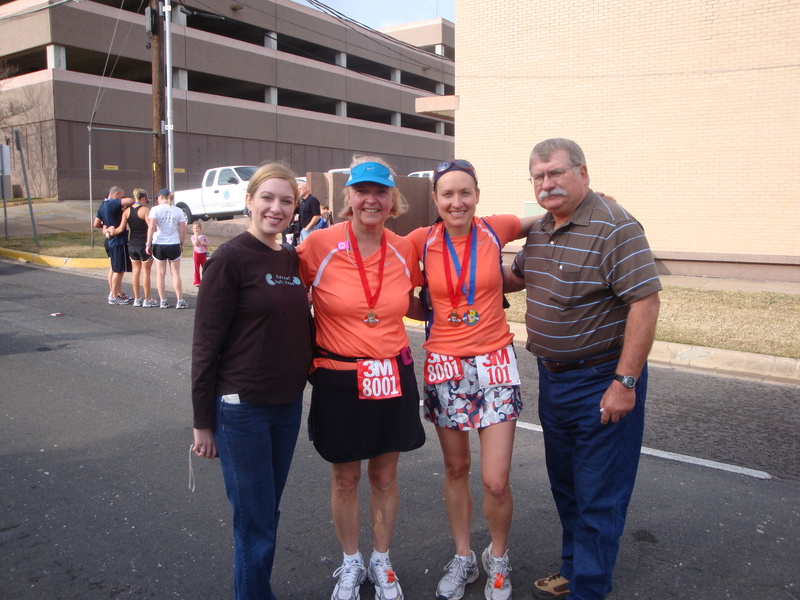 I am just glad I finished, because several times I was really feeling drained and dead. I never want to eat after a race. 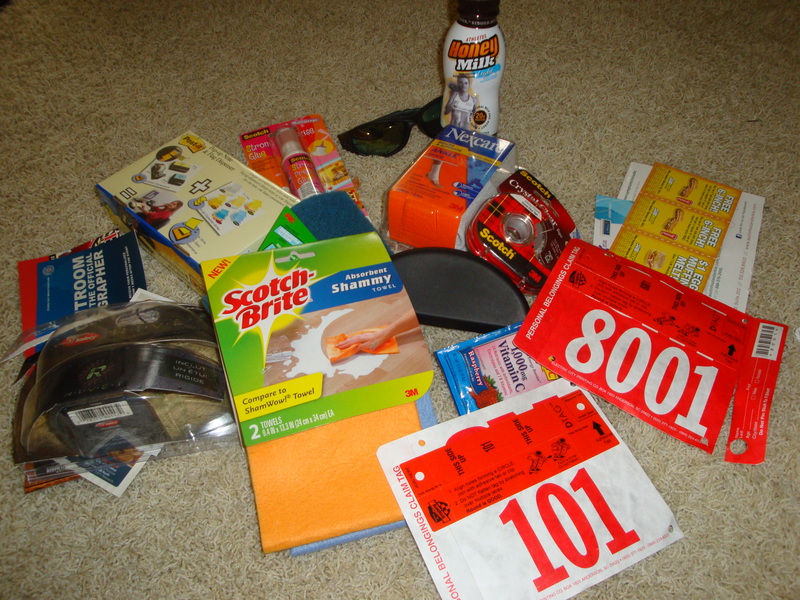 That doesn’t stop me from collecting stuff at the finish. Gave my Subway sandwich and juice to dad. Gave my freshly baked Tiff’s Treats cookies to sister. I didn’t bother getting pizza rolls or Rudy’s breakfast tacos. I LOVE Rudy’s, but I simply cannot eat eggs after anything more than 6 miles, it’s really bad news. 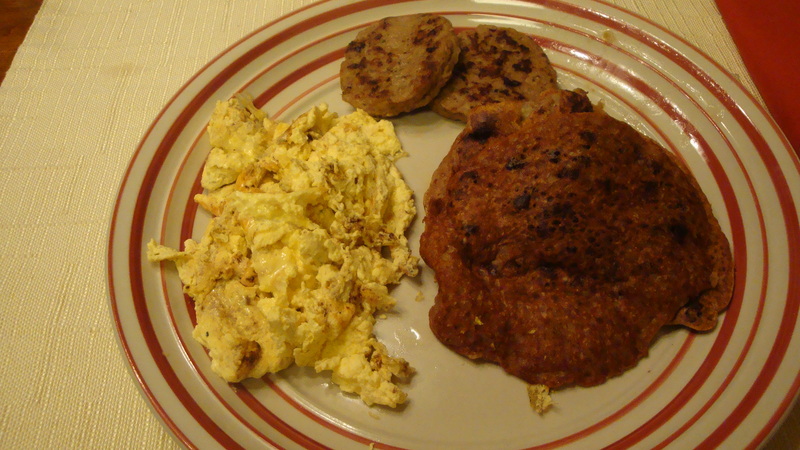 (I ate migas after my first half, which was 3M 2008 and it wasn’t pretty.) Threw the fruit and shelf stable stuff in my bag. Well I ate a banana, which I dropped half of on the ground. I didn’t want to wait in line for another banana, so I threw away the dirty part and ate the part still in the peel. I have no shame and I really wanted that banana. Then the stupid sun came out and it got really steamy. 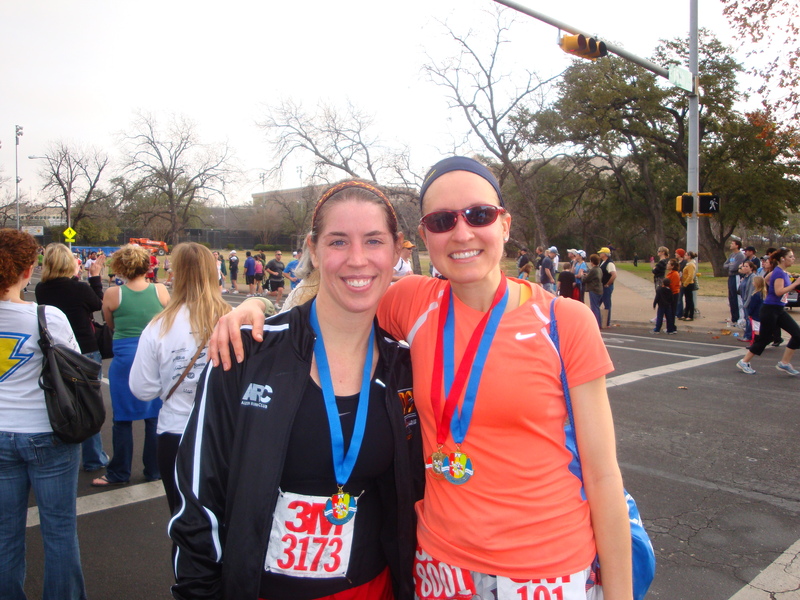 I ran into Megan again and we ventured to mile 13 to see the finish. We had about 15 minutes to spare. That’s my sister’s hand. She jumped in front of me when mom went by. Oh well, maybe she got better photos. It took be FOREVER to find my mom at the finish. Megan and I looked everywhere. (how did I run into Megan like 10 times before AND after the race, but have trouble finding my mom who was wearing the same shirt as me?) Finally I stopped to let some random dude use my cell phone and she walked up to me. (kind of forgot to plan a meeting spot at end). We went and took finisher photos (hope those turn out) and then she went to get her grub. Team Killer Kellers. Woot! We were in the family division for the relay, would have probably done better in open women (since it’s only women). Family photo. Yes, dad always looks mad in photos. He’s the nicest guy, really wish he’d smile. Sister and her boyfriend said they are going to run it next year. Need to find a partner for mom. Or I suppose I could do both races again. I would REALLY love if Dan would run it with her next year. Baby steps I guess. Mom and I rode the big yellow dog back North to my car. Original plan was to ride with family, but sister brought their dog and I didn’t want a giant muddy dog in my lap, so we rode the school bus and made a ton of friends. My mom was really popular on the bus 🙂 We rode in the back seat like cool kids, lol! Got back to my car and I realized we had no moolah! I meant to bring my so we could play. Had to go home, which was probably for the best because we stunk and were tired. 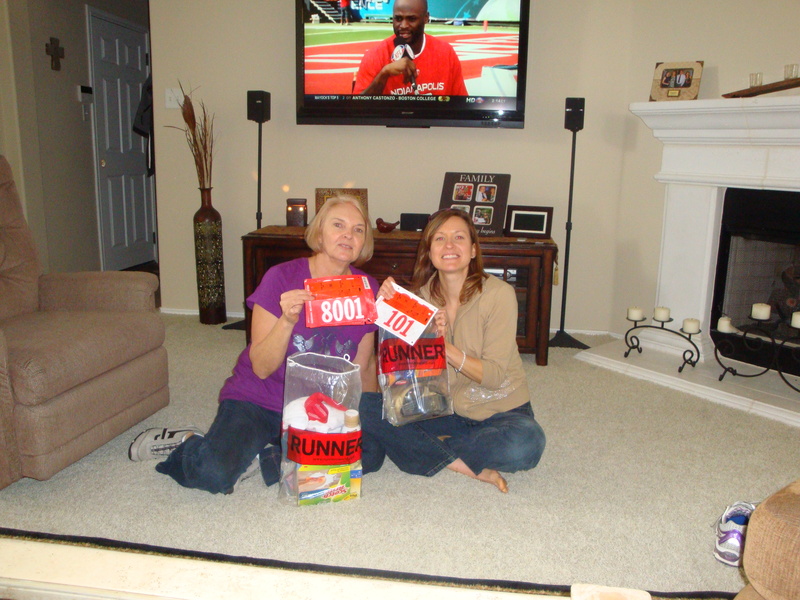 Gave mom the congrats bag I made her when we got home. I bought some stuff at our new location of Hill Country Running (which just happened to be 1 door down from my eye DR in Cedar Park). Yankz shoe laces (makes them slip ons), a Galloway book, and some fancy recovery bath salts. Then we had grilled sandwiches for lunch. I still wasn’t hungry, but I knew we needed to eat. I could really not eat all day after a long race, which I know is bad. So I’ve been eating little bits all afternoon until dinner tonight. 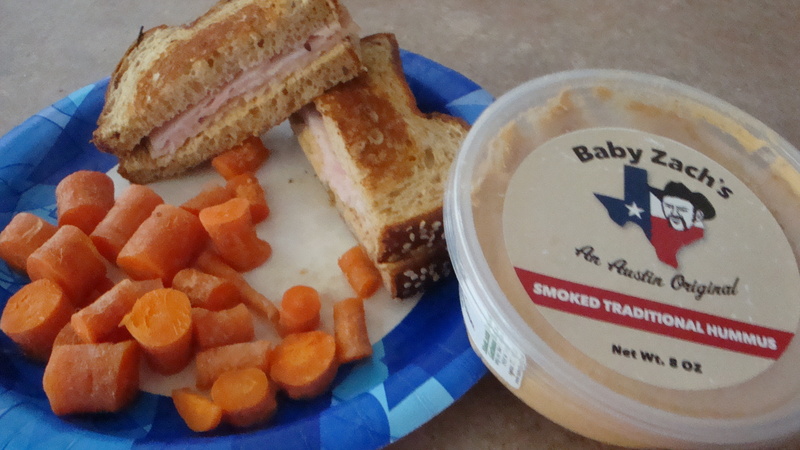 Cooked carrots (yes, I adore cooked carrots, especially roasted), grilled turkey and Baby Zachs Smoked Hummus (it’s 1 P+) on seedy bread. Dark chocolate and some more of those awesome tangerines for dessert. Then some Honey Bunches of Oats a few hours later. Then I hit the DVR to let mom watch “I used to be Fat” which is my new guilty pleasure. Multi-tasked by doing laundry and proceeding with a normal Sunday afternoon. Dan came home at 4 from his weekend away and crashed out, Dad is napping, sister is napping at her house, mom is watching Food Network. Aren’t we an exciting Sunday evening bunch? I woke up at 5, didn’t know what to do with myself. DOR on the schedule. I layed in bed for a hour. Then I got up ate my oatmeal and cleaned. At least my house is tidy! Met mom and dad at the farmers market in Cedar Park. I hadn’t been in a while, it’s actually grown and is way better. Mom bought a single praline, dad got some indian curried salsa (never heard of this). I got some of the most amazing tangerines and some smoked hummus. Baby Zachs smoked hummus is to die for. I tried all of them but bought the traditional. I will be back next weekend for another one! 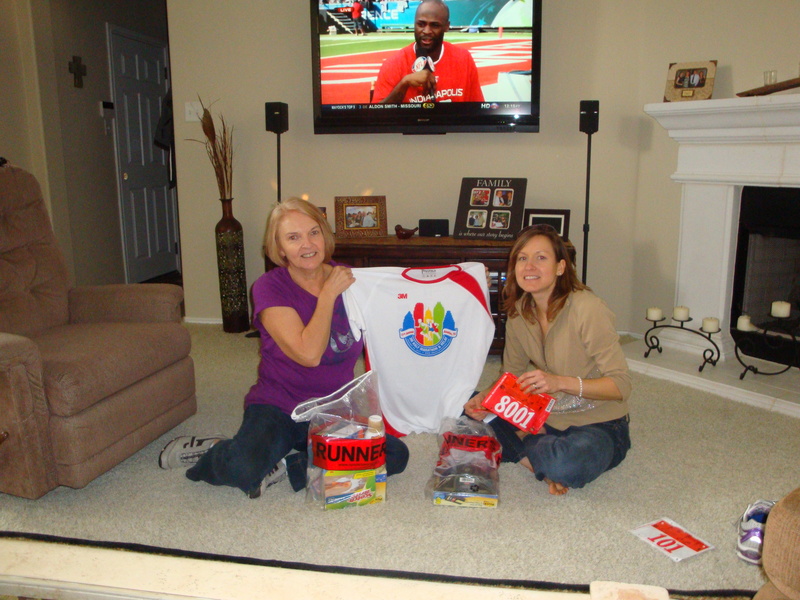 Came home and went through the 3M Half Marathon Relay swag bag with mom. This is the BEST swag ever. All 3 M products, a few other items, 0 filler and stupid paper trash. This is my #1 complaint about Rock N Roll races, their bags are almost nothing but crap. Ignore the fact that my dad doesn’t know how to zoom and that i’m too lazy and tired to crop. 3M finally did a tech shirt instead of a long sleeved white T. To be honest, I think the long sleeve T was better, because it wasn’t a weird tech fabric (I prefer tech, but not weird fabrics). I hate tech shirts that are weird fabric. It’s pretty though and white, so it’s perfect for my AM pre-dawn runs. 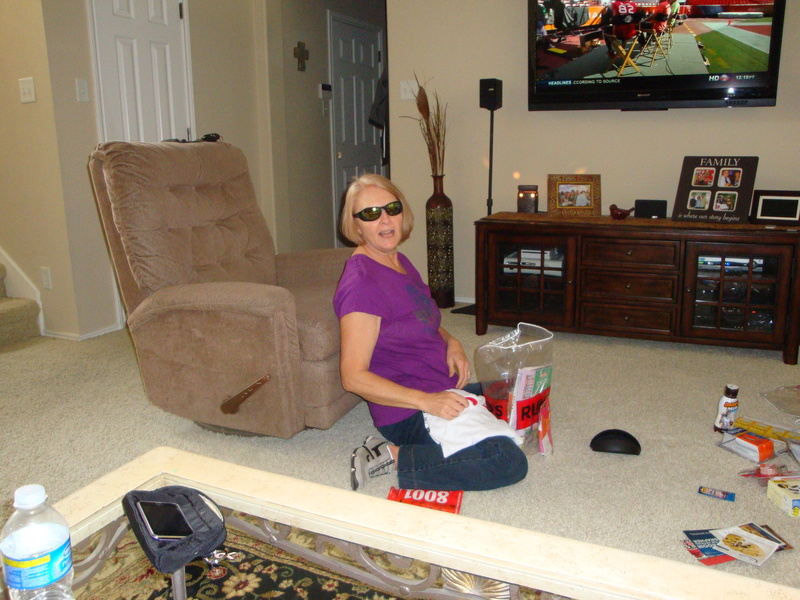 Mom rocking the awesome polarized shades that we got, they are awesome and came with a case. I love USEFUL goodies! Here’s most of my bag. Chamois, a really nice and heavy post-it note dispenser for notes and flags, Honey Milk (gave to Dan, I can’t drink it), several rolls of tape, some glue, free Subway coupons, sunglasses, some Emergen-C, and some other stuff I can’t remember. Missing? Band-aids and post-its. I have enough post-its from my other 2 years to last me for life. However, I really wanted the freaking band-aids. Everyone was saying they were sad and hate buying them. I pretty much cut myself everytime I shave my legs, so I need band-aids, lol! We chilled, I made dinner for Dad and sent him to sisters for the night (they were going to the race together). 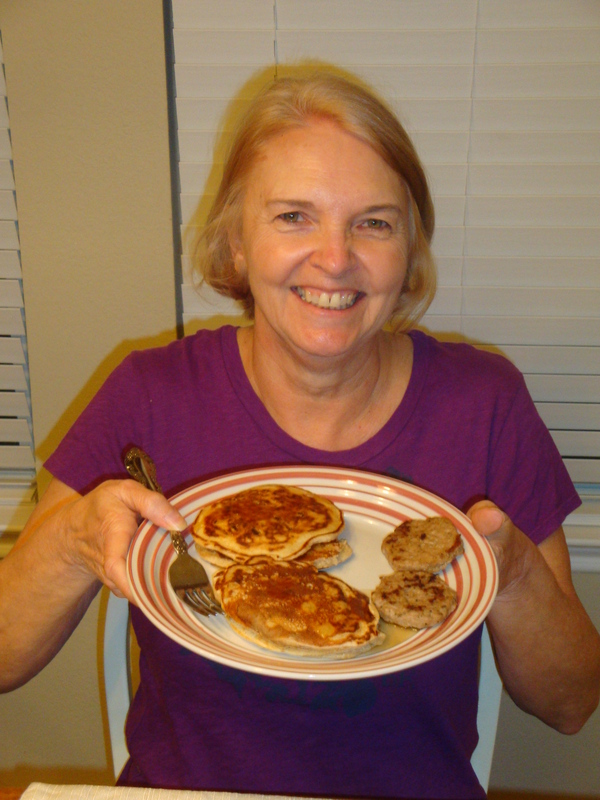 Mom and I dined on my favorite pre-race grub: brinner. Specifically, pancakes. Mom had cranberry-orange. She’s pretty excited about those. Mine kind of looks like poo. It’s really banana-chocolate chip. We watched some tv, both took epsom baths, and called it an early night! We would spend hours building our go-carts out of scraps and then ride them down the hill, only to find out we forgot the brakes.. After running into the bushes a few times, we learned to solve the problem. If YOU are one of those born between 1925-1980’s, CONGRATULATIONS! Was supposed to run at 5 am, but I couldn’t get myself out of bed. Cedar had beat me down and i’d slept horribly 😦 This set the tone for a grumpy day, because I’d so much rather get my runs done in the morning. I ended up running after work. I was tired, grumpy, but made myself go to the park and do it. I could tell just by looking at the air, that the cedar was horrible. Plus the trees were yellow-orange which means they are loaded with pollen. Running in CEDAR Park, probably not the best idea, but I didn’t want to deal with traffic or the gym. Got it done, but not without some serious breathing issues. Allergy induced asthma attack anyone? Luckily I don’t get those often. I couldn’t get home fast enough to throw the clothes off and decontaminate myself in the shower. 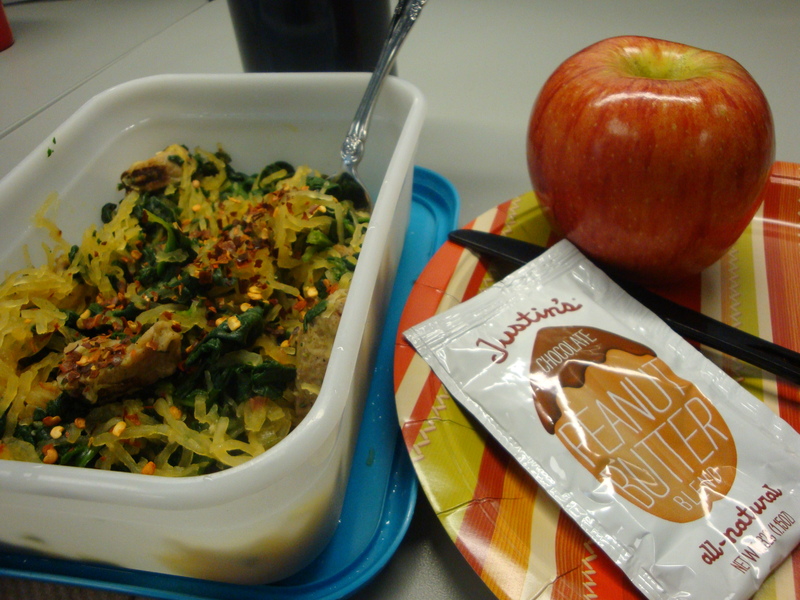 Same lunch as the last 2 days, last serving of the spaghetti squash stir-fry, which I really loved. I want to make it for Dan, but I think the texture of the squash wouldn’t be acceptable to him. Dan had plans after work, so I was on my own for dinner. I had nothing planned for tonight anyhow (which is rare!). I had the perfect lazy gals dinner, which I should also call “everything in this bowl is something Dan probably wouldn’t eat” aka chinese fried bulgur. Easy and simple, tons of variations you could do, meat or vegetarian. Start with 1/4 cup raw bulgur. I toss that into 1/2 cup boiling broth, cover and set away from heat for 15-30 mins (it’ll cook and absorb liquid at same time). Scramble an egg if you are using one. Dice meat (if using). Add to veggies. Add soy sauce or other oriental seasoning. Mix all, throw in a bowl. Visually appealing? Maybe not. Totally appealing to the taste buds though! Viola! Chinese-fried bulgur. 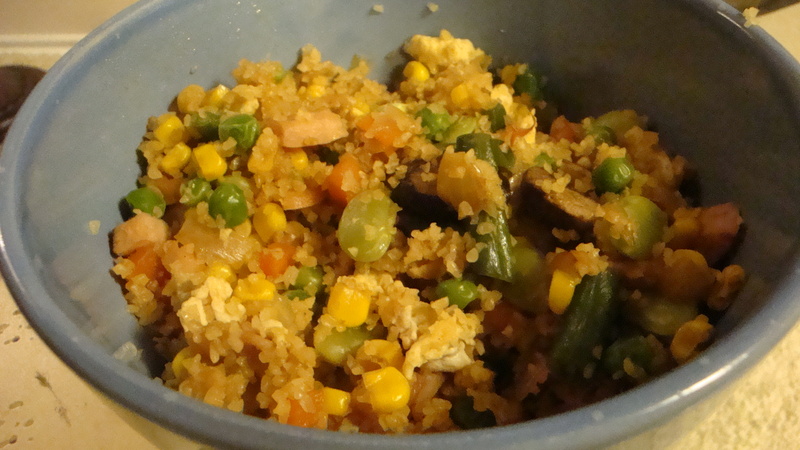 Diced chicken, bulgur, 1 egg, 1 cup of mixed veggies (corn, pea, lima, green bean blend), onion, mushrooms all stir fried in red-chile infused sunflower oil. Filling, easy, and delicious. Of those ingredients, I think Dan would only eat the chicken, egg, and onion, but only separately, lol. He hates green peas, cooked carrots, lima beans, mushrooms, any whole grain but white rice, and eggs for any meal other than breakfast. If you are wondering the P+, for my particular concoction, it was 8 P+. Varies on your ingredients and amounts used. You can make it more or less based on your tastes. It’s also great for using up leftover meat or veggies if you have any. Dessert was watching crap tv while eating one of the very best “ice-creams” yet. Hadn’t made any in about a week, and I was hungry for some. Chocolate with mixed raw nuts and dark chocolate chips. SO good. The raw mixed premium nuts were portioned into snack size servings for Dan’s work snacks, but i’ve been stealing a bag a day for my own use (shhh!). They are SO good. I felt badly because I read the clock wrong and I thought Dan came home at 2:59, not 12:59. I almost got really mad, because he had some important meetings at work today. When I went downstairs, I realized I looked at the clock wrong, I informed him I was nuts, and went back to bed. Had a surprisingly decent workout at the gym with weights before work. I’d slept horribly Monday night, so I am surprised and happy it went well. Maybe it was the “magic muffin” I had before the gym? Work was hectic and long. Had an eye Dr. appointment after work because I desperately need contacts. Unfortunately insurance pays almost nothing for vision. And my eyes got worse. At my perscription any change is bad. I hadn’t changed in almost 6 years, but this year I went up .5 in my contacts. Dr. reassured me it wasn’t the end of the world. I get REALLY worked up about the eye Dr. Most people dred the dentist, I dred the eye Dr. The new Dr. was really nice and probably younger than me, which was different, lol. Since my eyes are so bad, I authorized them to run some extra tests to make sure my retinas were ok and I wasn’t going to go blind any time soon. Lets just say I almost had a heart attack when I got the bill. She did tell me that I have no reasons to worry, but if I get any weird symptoms to call them ASAP, because I am at high risk for problems, but none were on the radar today. WHEW! Lunch was exactly the same thing I had the day before, it was tasty. Place chicken breasts in a dish with the dressing. Cover, and marinate in the refrigerator at least 2 hours. (I did overnight). 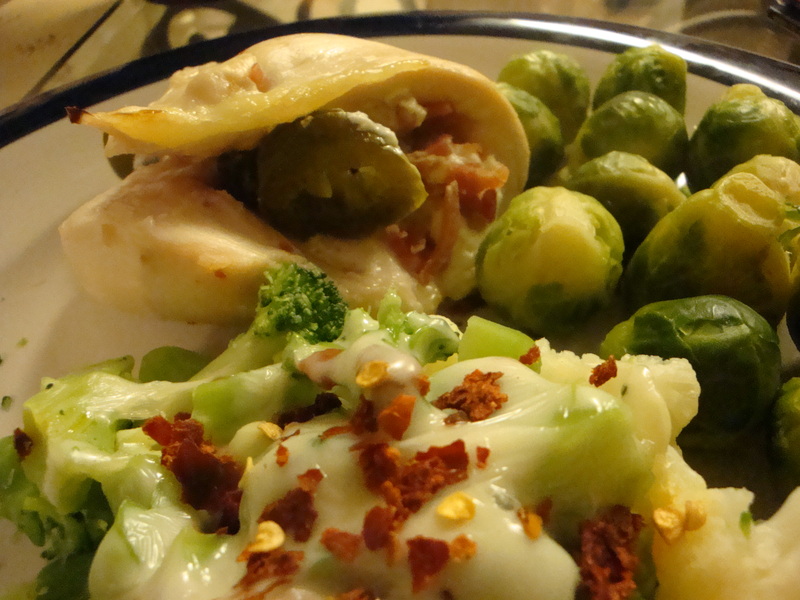 (If using sliced jalapenos and crumbled bacon like I did, just spread the cream cheese inside each chicken breast and add in jalapenos and bacon bits.) For Dan I did a strip of bacon on the outside too. Lightly oil the grill grate. Arrange wrapped chicken breasts on the prepared grill. Cook for 20 minutes, turning frequently, or until bacon is browned and the chicken juices run clear. (I baked in the oven at 375 degrees for 20-25 minutes.) 6 P+ , its the same if you have the bacon on the inside and out or just on the inside. Had it with brussel sprouts and spicy-cheesey broccoli-cauliflower blend (red chile flakes, red chili infused EVOO, swiss cheese). Dan got 2 piece of chicken and no broccoli blend. Ugh, silly little cooked veggie hater. It all started with me looking into doing Moe’s Better Half on March 6. I emailed my ARC buddy Megan (also the fabulous president) about it. 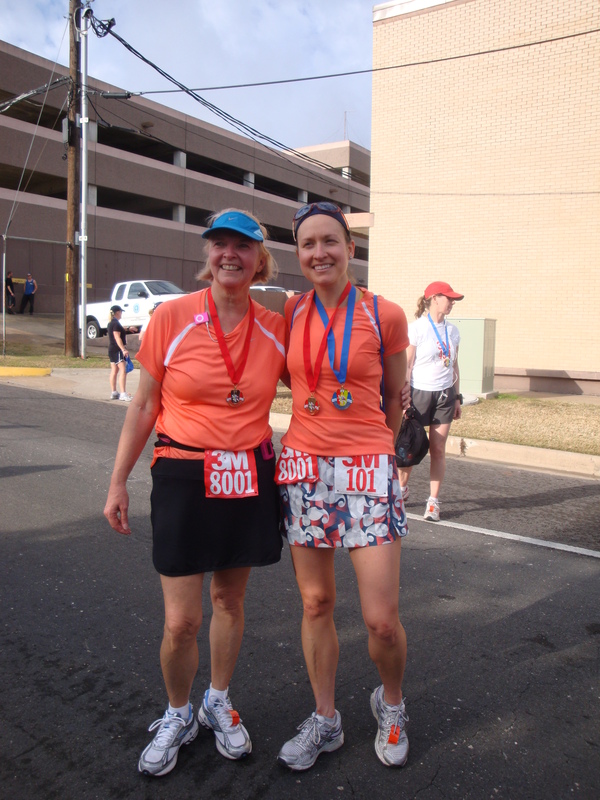 At the same time, I realized she doesn’t do that race anymore because she does Texas Independence Relay since it started. Since she raves about it 365 days a year, I figured that’s where she’d be. I emailed her about it to confirm and got invited to join her team which is a bunch of random people that she’d actually NEVER met before she ran with them on year #1 (this is her 3rd year). I in turn checked with AK and June to see if they’d like to do it too. Looks like my gals are in. I can’t wait to celebrate the holiday with 2 vans full of sweaty and stinky people that I don’t know 😉 There will be lots and lots of photos and stories. My grandmother would have been 91 today 😦 I couldn’t remember why 1/24 kept ringing a bell in my head. Then my mom told me she was headed to the cemetery to clean up and put flowers out. Sadness. Just in case you are wondering, she died a few years ago after being in a nursing home for a couple of years after a stroke. She’s in a much better place now. Speaking of my grandmother. It was her death that sent my mom off the WW wagon. I am so glad that 1 year ago I took my mom to have her first BODPOD, which encouraged to get her back on track. She’s had an amazing year. 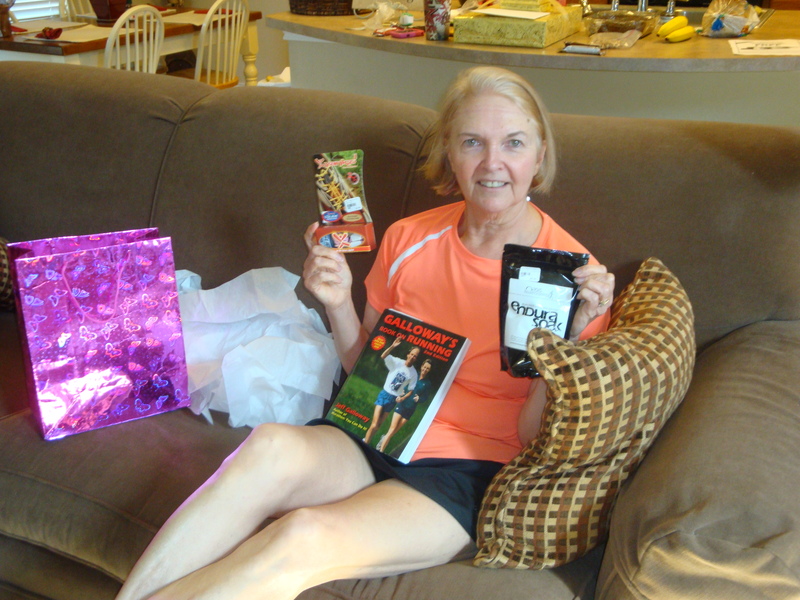 She recommitted to doing WW after her BODPOD results and joined meetings in December to earn her Lifetime status. She made goal today in her meeting. Kind of ironic that it happened on my grandmother’s birthday. I had made M-W lunches on Sunday afternoon. I’d opted to try the Spaghetti Squash and pork asian stir fry from the January 2011 Oxygen magazine. 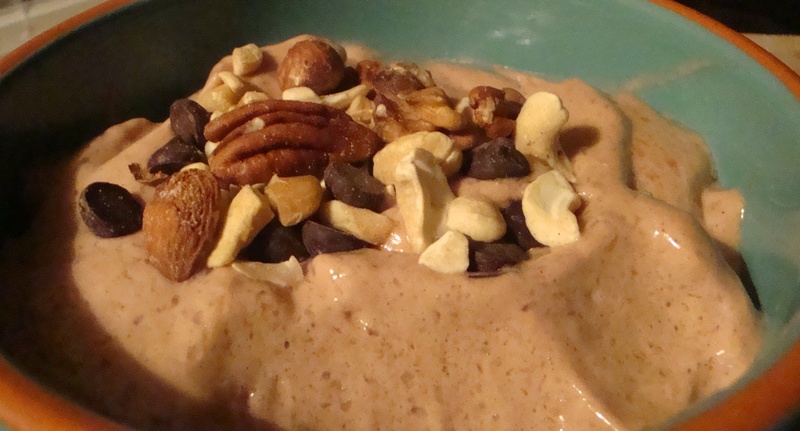 This would be awesome with other protein sources, including tofu or chicken, or even meatless. Makes 4 servings. Ready in 1 1/2 hours. Preheat oven to 350 degrees. 2. Cut squash in half and scoop out seeds. Place each half face down in 1/4 in. of water on a baking pan. Bake until the squash is tender, about 1 hour. Cool for 10 minutes and then shred flesh with a fork into a bowl. Discard the skin. 3. Slice pork into thin strips. 4. Heat a wok and swirl in the oil. Add in scallions and garlic, and cook until fragrant. Add pork, stirring for 2 to 3 minutes until cooked. Add squash and cook for one minute. Add the greens and cook for 1 minute. 5. Add soy sauce, vinegar, and chili paste and cook, stirring constantly for another 30 seconds. *Very good and I loved it! The way I made it, it took alot less time. I also made modifications. This made my NI different than what is listed (it’s straight from magazine above), but not by much. Mine was 6P+ a serving, which is the same P+ making it as listed (because I used less pork and made less servings). -I made it into 3 servings instead of 4. Hit the gym for some stairmill action after work. It was CROWDED. I hate in the gym in January, especially Mondays after work. Post-weekend guilt seems to get to people and then it dwindles as the week progresses. By Thursday it’s a ghost town. Knocked it out and remember to take some magazines again. YAY! Finally reading my mags, although maybe I need to start taking post-it flags to mark things, because now I don’t remember what i’d wanted to go back to, lol! After the gym I hit Target to get a new space heater for our artic master bath (I may have also got some new ballet flats). 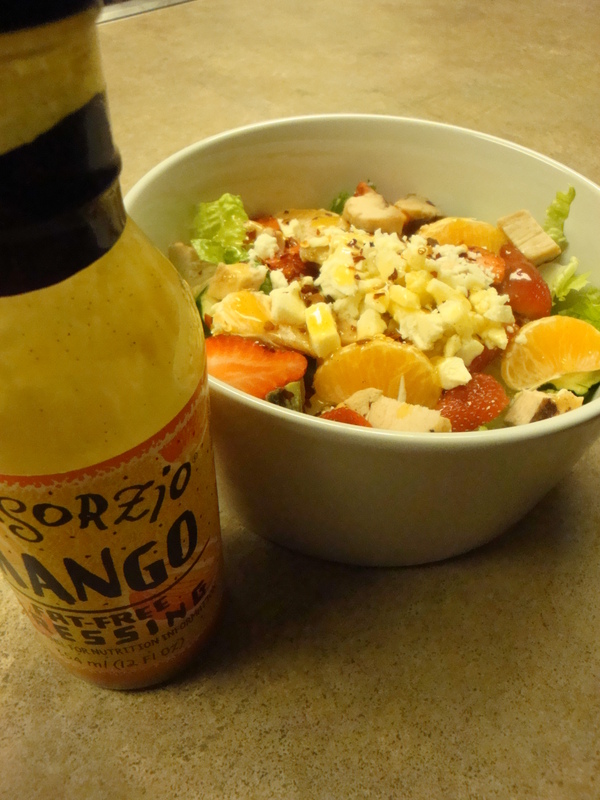 Used Consorzio Fat Free Mango Dressing. It’s kind of citrus vinegrette-y. Good for the salad I made. Forgot I had the stuff, it was in the back of our salad dressings in the door. I’d mostly used it in the past to marinade strawberries and oranges for a sweet and sour fruit salad type snack. 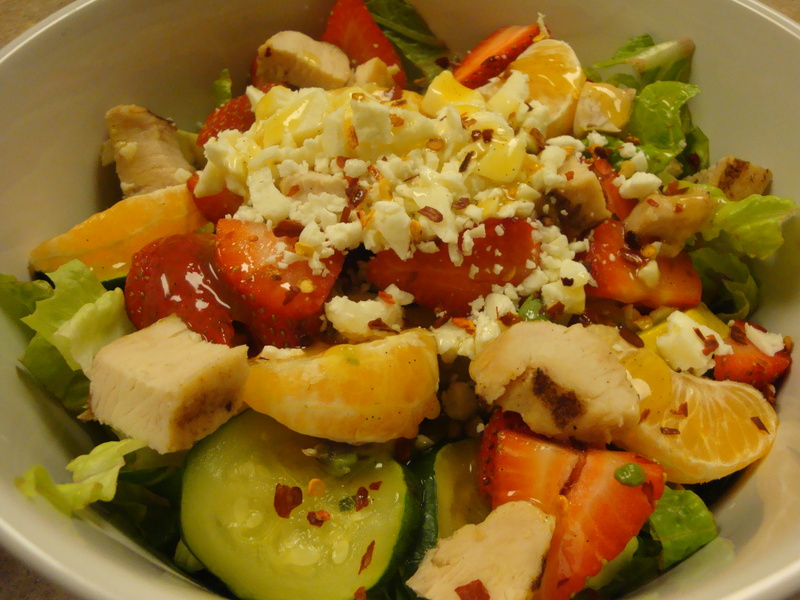 Romaine, grilled chicken strips, feta, red pepper flakes, the mango dressing, clementines, strawberries, and squash. The squash was a no-no, it threw the taste off, so I picked it out and ate it separately. Then it was divine! 2 slices toast on the side. Speaking of clementines, I am SO disappointed in the last box of cuties I bought. Almost half of them molded in less than a week and they didn’t have good flavor at all. Won’t be buying any more this season. The best ones are still the ones off my parent’s tree, but those are long gone (picked the last of them at Christmas).